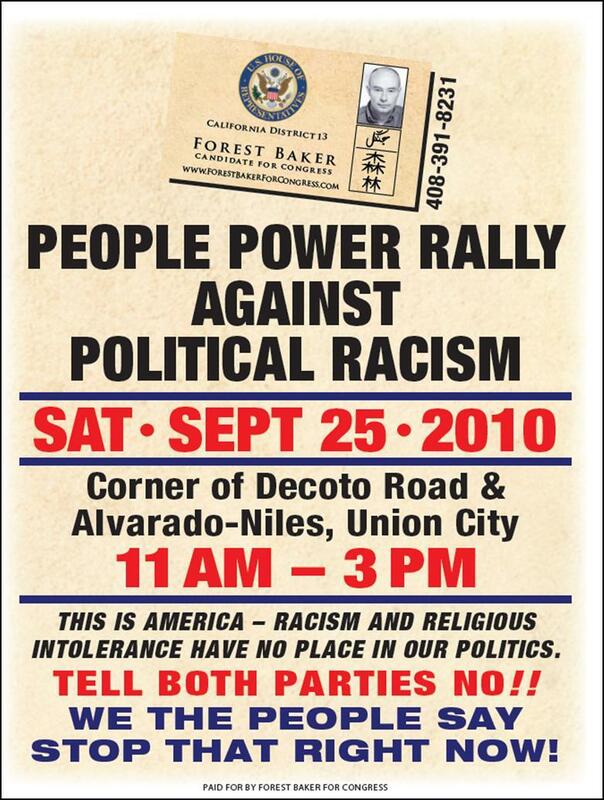 Union City, Calif. — Sept. 15, 2010 – In an effort to focus attention on solutions to our nation’s most pressing problems, Republican candidate for congress Forest Baker is organizing a “Rally Against Political Racism” on Saturday, September 25, 2010 in Union City, CA to condemn racism and religious intolerance within modern politics – amongst both parties. 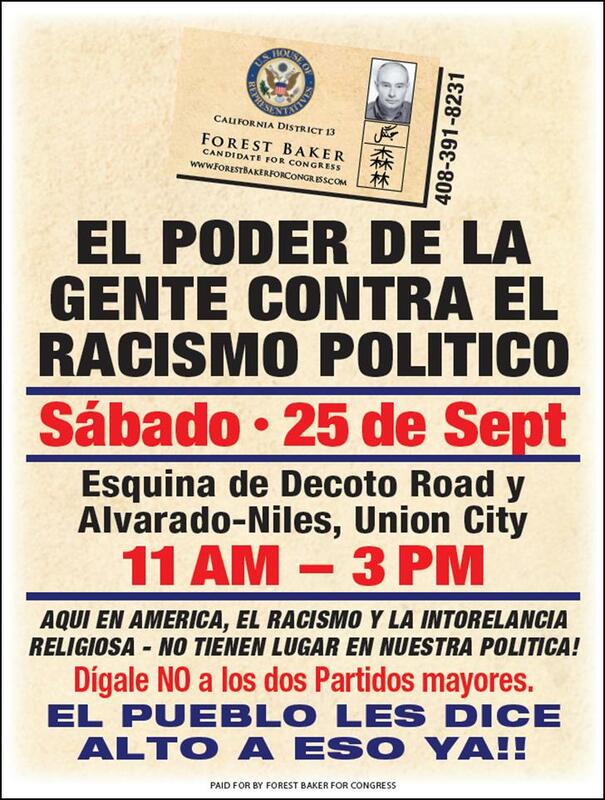 Baker would like to re-focus the local and national conversation away from race (the Arizona immigration law) and religion (the controversial mosque near Ground Zero), and towards permanently fixing our sputtering economy and winning the war in Afghanistan. “Last month I spoke with (Stark) about joining with me in a public declaration of protest regarding political intolerance. I welcome his participation and urge Pete to support all of us here in Congressional District 13 as we direct the conversation back toward appropriate political issues and as we decry the politics-as-usual games that corrupt our basic freedoms. We should all want to talk about how best to make this Great Nation stronger, rather than to stand idly by as our politicians invite self-destruction,” Baker said. Baker is available to comment further on his 9/25 rally, and invites all members of the media to attend the event. This entry was posted in Campaign Corner and tagged alameda, campaign, congress, conservative, democrat, dublin, election, event, forest baker, fremont, hayward, hispanic, liberal, mid-term election, moderate, newark, pete stark, pleasanton, race, racism, rally, republican, san leandro, san lorenzo, spanish, sunol, tea party, union city. Bookmark the permalink.